Hello! I've been having some issues with the size of the .xnb files when building my project. I tried doing my research but I could not find anything that would help me with my problem. This is the topic I found that resembles my issues but none of the answers helped me out. I was previously using MonoGame 3 (Windows app) and switched to 3.4 (WindowsDX). When I used the new Pipeline tool to generate my XNB files (primarily .PNG fiels), the size of the new XNB files got way bigger, from 100 megs total to 300 megs total. This is because some .XNB files were mere kilobytes built the old way and are now often over 3 megs built from the new tool. Anything I can do in order to reduce the size of these or is that just the price I pay for upgrading? I have around 30 MB worth of .png images that jump out to 3 GB of .xnb.deploy files, I've tried a lot of things to solve this but I can't seem to solve this issue. I'm running the latest Monogame version (3.6) and tried many different conent pipeline settings without any luck. I tried in both Debug and Release mode. Appreciate any help with solving this issue! Isn't this relating to that thing.... umm where there are multiple sizes of the same image in the same image, forgot the name, mipmaps? or something... could be the reason why? I don't think so, my images are just frames that make up a sprite sheet that I use for animation. My processor parameter for GenerateMipmaps is set to False not sure if that helps. Are they a ^2 format? Tried again with Compress set to True and HiDef - Build 274 succeeded, 0 failed, Time elapsed 00:02:58.69. So I tried it out in my main project with Compress set to True AND HiDef and hallelujah it worked. The entire bin folder makes up 25 MB. However now I have a different issue, the building time takes even longer than before. It used to take around 2 minutes now I'm up to 4 minutes. I mean I'll take it but I'm planning on having 10-20 times the amount of content I have right now, that won't work later. Build 537 succeeded, 0 failed, Time elapsed 00:04:10.94. Any suggestions for the building time? Yo' I'm aware that some compiled content(texture) size is 8x bigger than the original source, the reason mostly I loaded my texture contents through stream, and from other content I wrote my own mesh loader not using the MG content pipeline tools. "Any suggestions for the building time?" IMO I really don't mind how long it takes on building contents, what I would mind is long it takes to load. Have you tried manually resizing them to a power of 2 and seeing how it affects things? What CPU are you rocking? "Build 537 succeeded, 0 failed, Time elapsed 00:04:10.94." Yo dude, I haven't notice this, your rebuilding all your 537 content, while I only rebuild the newly added or modified content. 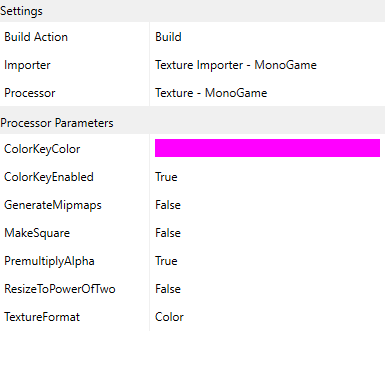 If your using the "MonoGame Pipeline Tool" you can right click a single content you want to compile and select [Rebuild]. The file sizes are so large because when MG processed a texture the raw color data is stored without any compression. To reduce build times, always run Build and not Rebuild. The Pipeline Tool is smart and stores the last modified timestamp of processed files to check if they changed since they were last built and skips them if they have not. Are DDS files just passed through or do those go through everything as well? To be more specific, are the traits of the source DDS file preserved, such that a DXT3 DDS file w/ mips is not transformed into Color. I'm not seeing anything related to the headers (for DDS) so I assume so, but just because I don't see it doesn't mean they're not just being restructured. Edit: outside of the content-pipeline that is, which is pants-shittingly nuts in DDS handling. I don't know how the DDS importer is implemented. Just for completeness in this thread , you can set the format of textures to compressed. This will use a lossy block compression format that can be natively rendered on the platform you're targeting (e.g. dxt for desktop). I.e. the texture does not have to be decompressed to draw it to the screen. The savings in file size are (in almost all cases) not even close to what you'd get using the generic compression, but since the texture data does not have to be decompressed and the textures are smaller when sent to the gpu, loading and rendering the image is faster. The texture importer will reprocess DDS files through the same path as the other images. It will throw way the dxt compressions & mipmaps and re-create them. I have a pass through DDS importer that currently works for DXT1 cubes. You could use it as a template to implement dxt3.